If you follow my Instagram account, you probably saw pictures of this recipe a few days ago. 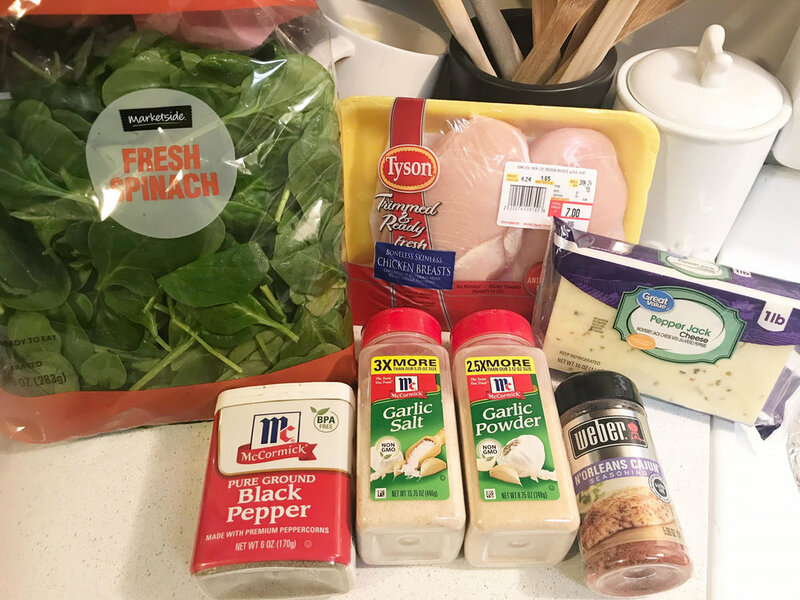 I just wanted to make something quick and easy for dinner and this limited ingredient chicken recipe was a breeze! Even more appealing, was that it is full of big flavors that will please any palette. As always, the recipe is below for your convenience. Scroll down for step by step instructions with pictures and quick tips! Place chicken breasts in a lightly greased baking dish (I recommend a 9x9 for two breasts and a 9x13 for 3 or more). With a sharp knife, carefully cut 5 slices about 1 inch apart through the top of the breasts. Do not to slice all the way through. Set dish aside. On a cutting board, slice 6 slices of the Monterey Jack cheese (as thin or as thick as you’d like). 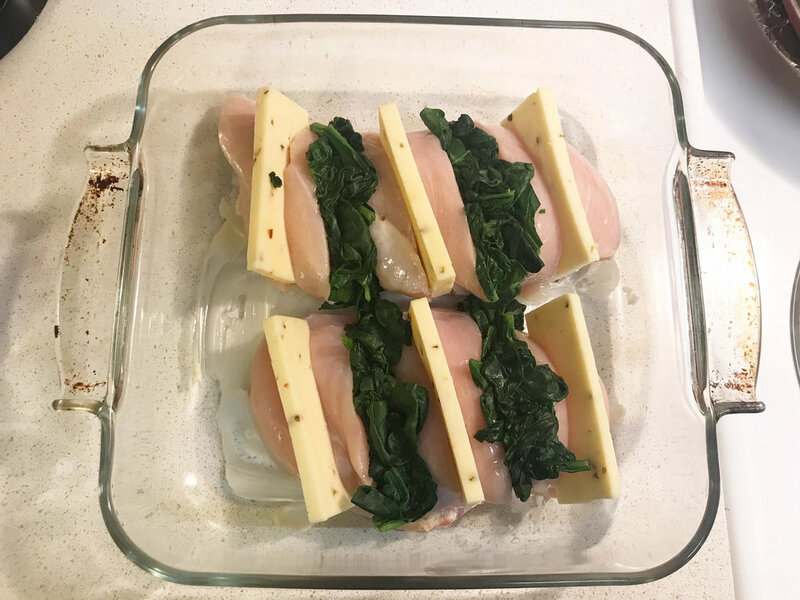 Place the slices of cheese in every other slit in the chicken breasts. Wilt the spinach by placing it in a skillet over medium heat. Stir occasionally for about 4-5 minutes. Place a spoonful ( roughly 1/4c) of wilted spinach in the remaining chicken slits. Sprinkle the Cajun seasoning, garlic salt, garlic powder and pepper evenly over the chicken breasts. Bake the chicken breasts for 30-40 minutes.Remove from the oven and let rest for 2-3 minutes. OPTIONAL: place a little butter on each spinach mound for extra flavor. It’s always helpful to gather your ingredients before you get started cooking! This recipe is especially nice because besides the seasoning, there are only 3 ingredients! Preheat your oven to 350 degrees to warm while you are prepping the chicken. Place chicken breasts in a lightly greased baking dish. A square 9x9 for two breasts works great! Make sure you use a dish wish raised sides to catch any melted cheese! Wish another sharp knife, carefully cut 6 slices of Monterey Jack cheese from the block. 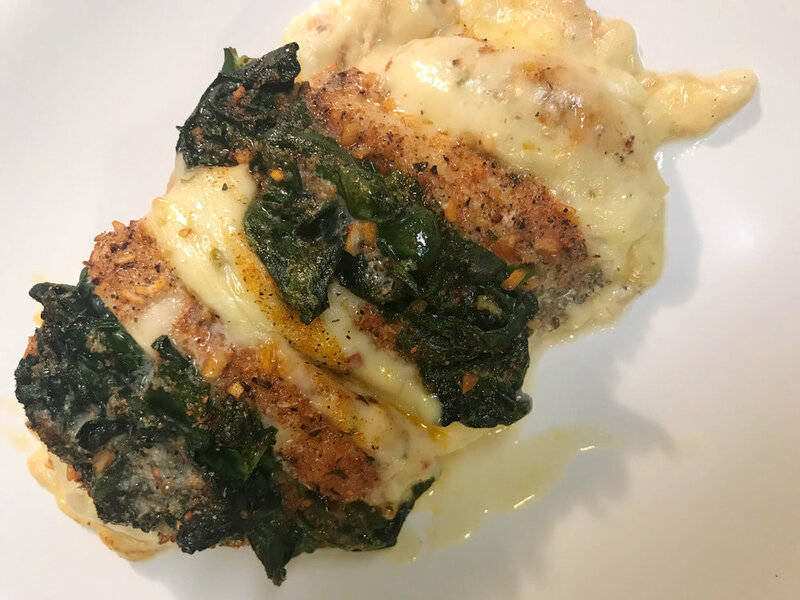 You can certainly use pre-cut slices here, but we are a cheese loving family so I’ve found that this allows us to make the chicken extra cheesy when I can control the thickness of the cheese slices! Place each slice of cheese in every other chicken slit. Next, wilt the spinach by placing it in a skillet over medium heat. Stir occasionally until wilted (about 3-4 minutes). Note that a lot of spinach only goes a little way! The wilting process will significantly reduce the appearance of the amount of spinach that you have. Once the spinach has wilted, use a spoon or a small pair of tongs and place about 1/4c of the spinach into each of the remaining chicken slits. Then, sprinkle the seasonings evenly on the chicken. Feel free to add more or less seasoning to taste. If your family is sensitive to spice, consider a more mild cheese or replacing the Cajun seasoning with something more mild. Bake the chicken for 30-40 minutes at 350 degrees or until the juices run clear. As soon as your remove it from the oven, you can add a little pat of butter on top for extra flavor, or even an extra slice of cheese! Let rest for 2-3 minutes and serve with your favorite potato dish!